Race Day, Father’s Day & Christmas Day all at Slideways! Home Race Day, Father’s Day & Christmas Day all at Slideways! Race your way to the Sydney 500 V8 Supercars meet with two friends! The second round of our Slideways Go Karting World Enduro Series is THIS SUNDAY, with double points on the line in the race to the Supercars Sydney 500, and the Pepsi Max National Hire Kart Challenge. Very limited positions remain available, we are close another sell out like round one. 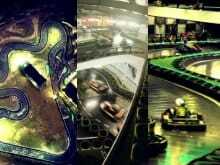 Check out the website for all of the details and contact the team at Slideways Go Karting World today. See you trackside! Father’s Day: Sunday September 4th, think Go Karting! Did you know you can give a Slideways gift voucher for absolutely any of the go karting session combinations we offer? You can purchase them in-venue, or over the phone via registered post, which in the lead up to Father’s Day we are offering free of change! Check out Slideways Go Karting Brisbane, Slideways Go Karting World and Slideways Go Karting Gold Coast for all of the details. Christmas is Coming to Slideways! It’s not long now until Christmas, with Slideways once again leading the way as your perfect Christmas Party location! The best time slots at all three of our venues are quickly filling up, check out our Christmas Party pages at Go Karting Brisbane, Go Karting World and Go Karting Gold Coast for more info.